(Francisco Kjolseth | The Salt Lake Tribune) U.S. President Donald Trump is surrounded by Utah representatives at the Utah Capitol on Monday, Dec. 4, 2017, as he signs two presidential proclamations to shrink Bears Ears and Grand Staircase-Escalante national monuments. President Donald Trump, right, meets with Navajo Code Talkers Peter MacDonald, center, and Thomas Begay, left, in the Oval Office of the White House in Washington, Monday, Nov. 27, 2017. 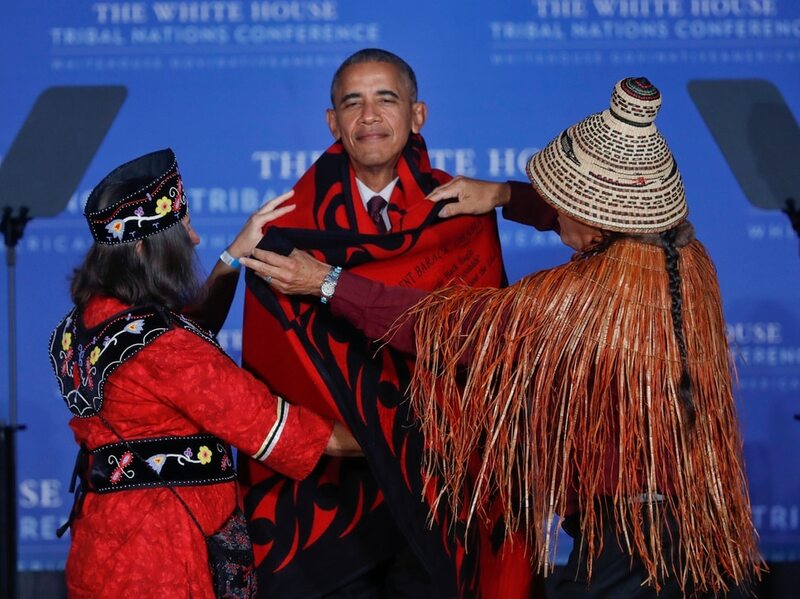 (AP Photo/Susan Walsh) Mohegan Chief Lynn Malerba, left, and Brian Cladoosby, right, President of National Congress of American Indians, cover President Barack Obama with a blanket at the 2016 White House Tribal Nations Conference, Monday, Set. 26, 2016, at the Mellon Auditorium in Washington. (AP Photo/Pablo Martinez Monsivais) File - In this Jan. 2, 2017, file photo, protesters rally against the Dakota Access Pipeline behind the 128th Rose Parade in Pasadena, Calif. The front lines of the battle against the $3.8 billion Dakota Access pipeline are shifting away from the dwindling encampment in North Dakota. (AP Photo/Michael Owen Baker, File) Trent Nelson | The Salt Lake Tribune Mark Maryboy speaks as Utah Din Bikyah (UDB) and Tribal leaders stand in support of protecting the Bears Ears at a rally today in the Utah State Capitol Rotunda in Salt Lake City, Wednesday May 18, 2016. Attendees at the rally called for President Obama to protect sacred sites and honor ancestral lands by designating Bears Ears National Monument. Steve Griffin / The Salt Lake Tribune Utah Dine Bikeyah board member Jonah Yellowman listens as Utah Dine Bikeyah chairman Willie Grayeyes answers questions during a stop at the Urban Indian Center in Salt Lake City Wednesday June 1, 2016. Five board members are touring the state meeting with Native Americans to drum up support for the Bears Ears national monument and answer questions in the face of allegations their groups is a front for outside environmental groups. Steve Griffin / The Salt Lake Tribune Utah Dine Bikeyah board member Albert Holiday prepares for a meeting during a stop at the Urban Indian Center in Salt Lake City Wednesday June 1, 2016. The board members are touring the state meeting with Native Americans to drum up support for the Bears Ears national monument and answer questions in the face of allegations their groups is a front for outside environmental groups. Chris Detrick | The Salt Lake Tribune Hundreds of people gather during the Monumental Rally for Bears Ears and Grand Staircase Monuments at the Utah State Capitol Saturday, May 6, 2017. (Chris Detrick | The Salt Lake Tribune) Supporters of the Bears Ears and Grand Staircase-Escalante National Monuments rally at the Utah State Capitol Saturday, December 2, 2017. Utah Highway Patrol estimated 5,000 people attended the rally. (Rachel Molenda | The Salt Lake Tribune) Daniel Tucson, of Salt Lake City, burns sage and prays at a protest against shrinking Bears Ears and Grand Staircase Escalante national monuments on Monday, December 4, 2017. (Rachel Molenda | The Salt Lake Tribune) Protesters gathered at the capitol building in Salt Lake City, Utah, on Monday, December 4, 2017, to protest President Donald Trump's plan to shrink Bears Ears and Grand Staircase-Escalante national monuments. Washington • President Donald Trump approved the Keystone Pipeline despite strong objections of Native Americans. He repeatedly calls Sen. Elizabeth Warren “Pocahontas,” in a way that’s not meant to be nice. And now Trump has slashed southern Utah’s Bears Ears National Monument — essentially the first Native American-pushed monument — by more than a million acres to a fraction of its original self. Just 11 months into office, Trump has earned a rebuke from a swath of Americans still reeling from a historically caustic relationship with the federal government. 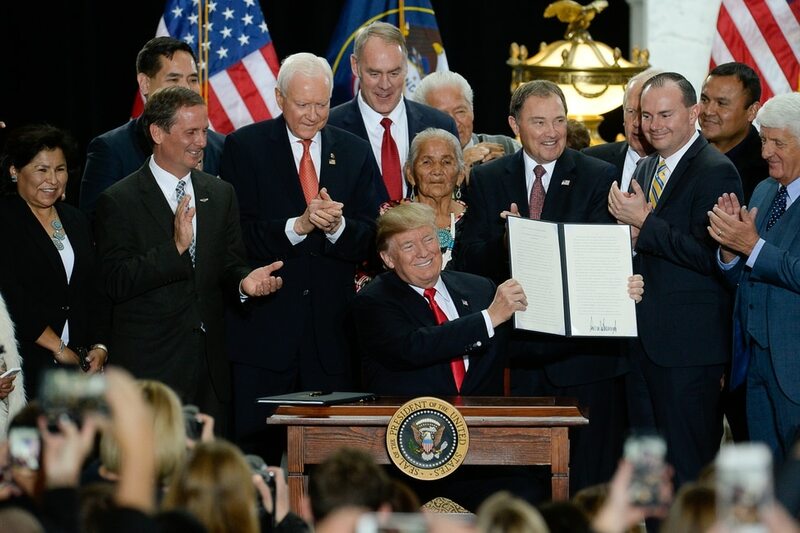 “He’s not good for tribes,” said Natalie Landreth, senior staff attorney of the Native American Rights Fund, which represents the Hopi, Zuni and Ute Mountain Ute tribes that have sued Trump over his order to shrink the 1.35 million-acre Bears Ears monument into two separate monuments totaling about 200,000 acres. It’s a sharp turn, say Native American leaders and other observers, from the Obama administration’s outreach to Native peoples that included launching annual tribal conferences to bring together tribal leaders with U.S. officials as well as a host of actions that tribes had sought. The White House held the tribal conference every year of Obama’s two terms. The Trump administration did not announce one this year, though the administration has invited some tribal groups for meetings. Landreth said Obama made some of the “largest leaps forward” for Native people in his time in office, but the relationship has soured with the new Oval Office occupant. She noted that Trump didn’t respond to outreach by the tribes pushing to keep the full Bears Ears monument, a move that added to the insult they feel. Tribal leaders feared Trump would not be as friendly to Native Americans as Obama, given his history with tribes. In the early 1990s, Trump, trying to combat tribal casinos that were digging into his gambling empire, alleged that Native American leaders were under the mob’s control and were trafficking in drugs. He even charged that the Native Americans weren’t really native. “I might have more Indian blood than a lot of the so-called Indians that are trying to open up the reservations,” Trump told radio host Don Imus in 1993. Technically, Congress has to make that happen, and legislation has been introduced to allow it. However, all seven Utah chapter houses of the Navajo Nation that surround the monument had favored the original designation, with 163 Navajos wanting to keep the larger monument and three opposing it in a recent vote. That’s part of the problem, some Native leaders say: Trump isn’t listening to their people. Shaun Chapoose, a member of the Ute Indian Tribe Business Committee, says the Bears Ears shifts and the lawsuits that followed are going to widen the gulf between Native Americans and Trump, and it all could have been avoided by listening to the tribes. Chapoose said the Obama administration’s tribal conference and approach had created a two-way street for discussions of Native needs. He described Trump’s first-year relationship with tribes as “rocky, that’s for sure,” undermining the gains Native Americans made in the past eight years. It’s typical that the pendulum of relations with tribes swings between Democratic and Republican administrations but in this case, Chapoose said, it is dramatic. The White House defends Trump’s relationship with Native Americans. After Trump made the recent “Pocahontas” remark, White House press secretary Sarah Huckabee Sanders said she didn’t think that it was a racial slur and that was not the president’s intent. Zinke, the Interior secretary who is an adopted member of the Assiniboine Sioux Tribe, insists the administration has a good relationship with Native Americans and maintains the change to Bears Ears would help those tribal members who live in the area. During that month, though, news broke that Trump would reduce the Bears Ears monument by more than 85 percent. Ethel Branch, attorney general of the Navajo Nation, says tribes hope to open a line of communication with Trump’s White House as they have with his predecessors. So far, though, it hasn’t been as successful. “I do have concerns that this relationship is a one-way relationship,” she said, pointing to worries that the Trump administration doesn’t understand tribal sovereignty. “It is very disappointing to see a lack of regard for that,” she said. “And a lack of willingness to understand the need for that protection” of the Bears Ears area. Sally Jewell, who served as Interior secretary under Obama, said there’s no question that the deep bond formed between tribes and the federal government has weakened since Trump took office. During a fellowship at Harvard University this fall, Jewell said she brought in Native American leaders for a forum. They weren’t happy. Jewell, who oversaw the creation of the Bears Ears monument and had visited the area to hear from local officials and hike the region, said the Trump team listened only to anti-monument San Juan County officials and Utah’s elected leaders who wanted to get rid of it. The monument wasn’t about a legacy for Obama, she added, but for future generations and was meant to honor tribes that had made the land their home for ages. One that, for tribal leaders, still stings.